The most affordable Wolfgang model yet is decked out with a flat top featuring a special “comfort cut” forearm contour for max playing ease. 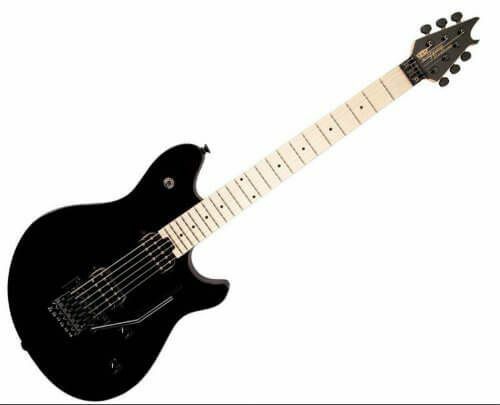 Other features include a one-piece bolt-on maple neck with satin finish and graphite reinforcement, smooth and fast compound radius maple fingerboard (12”-16”) with comfortably rolled edges and 22 jumbo frets, dual EVH Wolfgang direct-mount humbucking pickups, two domed black control knobs (master volume, master tone), EVH Floyd Rose Special bridge and locking nut, and EVH tuners. Case sold separately. With classic red, black and white striped style that pays homage to Van Halen’s original guitar, giant sound and high-speed playability along with player-oriented features, this latest take on the Wolfgang Special is ready to crank out some serious rock. Features an arched top basswood body with a robust graphite-reinforced quartersawn maple neck—carved and rolled to EVH’s exacting specifications. The speedy 12”-16” compound radius ebony fingerboard facilitates energetic riffing and blazing leads, and is the only Wolfgang Special finish to feature an ebony fingerboard besides the Stealth model. Also new for a Wolfgang Special model is its chrome hardware and non-matching black headstock, while other familiar traits include 22 jumbo frets and heel-mounted spoke wheel for easy truss rod adjustment. The crystal clear Custom Designed EVH Wolfgang Humbucking pickups are direct mounted, supplying girth and sparkle, as well as near-endless sustain to power chords and melody lines. Every component of the guitar has been selected and positioned for high-speed playing. The low-friction volume knob lets you perform speedy violin-like volume swells with ease while the tone knob resists easy turning—avoiding unwanted tonal shifts as your picking hand flies furiously across the strings. The rock-solid EVH-branded Floyd Rose® Locking Trem combines with the Floyd Rose Locking nut to maintain precise tuning, no matter how insane your whammy-bar histrionics get. The EVH D-Tuna® retunes to Drop-D and back with strict accuracy at the mere flick of a finger, making this the only guitar you’ll need onstage. The most affordable Wolfgang model yet boasts a beautiful basswood body with a flat top and special “comfort cut” forearm contour for max playing ease. 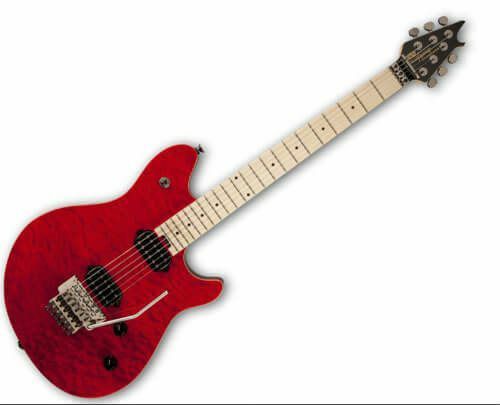 Other features include a one-piece bolt-on maple neck with satin finish and graphite reinforcement, smooth and fast compound-radius maple fingerboard (12”-16”) with comfortably rolled edges and 22 jumbo frets, dual EVH Wolfgang direct-mount humbucking pickups, two domed black control knobs (master volume, master tone), EVH Floyd Rose® Special bridge and locking nut, and EVH tuners. Road-tested in arenas around the world, the EVH Wolfgang Special offers giant sound, ultra-high-speed playability and spotlight-ready style. The EVH Wolfgang Special features an arched top basswood body with a robust graphite-reinforced bolt-on quartersawn maple neck, carved and rolled to Eddie’s exacting specifications. Primed for energetic riffing and blazing leads, its 12”-16” compound radius maple (ebony on Stealth finish only) fingerboard has a hand-rubbed back finish with 22 jumbo frets and black dot inlays. A pair of flagship custom designed EVH® Wolfgang Humbucking pickups are mounted directly to the body, providing dynamic yet articulate voicing, as well as near-endless sustain for powerful chords and melody lines. A sturdy and dependable EVH-branded Floyd Rose locking trem and Floyd Rose® locking nut work in tandem for endless sustain and precise tuning, while truss rod adjustments have never been easier with a convenient spoke wheel at the base of the neck. This purebred music-making machine is offered in a variety of eye-catching finishes with matching headstocks and black hardware. Unique from the other finishes, the elegant Wolfgang Special El Natural is also richly accented by tobacco-stained back and sides. 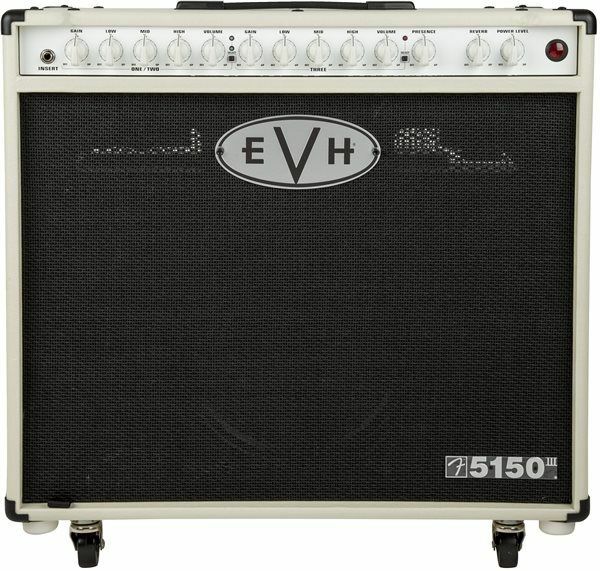 The EVH 5150III® Combo is a tube combo amp with one Celestion® 16-ohm speaker and three channels (clean, crunch and lead). Powered by seven JJ ECC83 (12AX7) preamp tubes and two JJ 6L6 power tubes, it also features front-panel adjustable power output from 50 watts down to one watt. (controls all three channels and reverb). Construction features a custom-shaped birch cabinet with special internal baffling, vintage-style chicken-knobs head control knobs, red jewel, plastic top strap handle, and casters. Fitted cover optional. Available in Black and Ivory. The most affordable Wolfgang model yet is decked out with a flat top in gorgeous quilt maple and featuring a special “comfort cut” forearm contour for max playing ease. When Eddie Van Halen introduced his famous red, white and black striped 5150® guitar in 1984, he never would have fathomed the thousands of copies it would inspire. But then again, Eddie has made a career of being copied in every which way imaginable. EVH® Gear proudly introduces a new Striped Series 5150 model based on his original instrument, featuring his distinctively striped 5150 motif and single humbucker setup. The Striped Series 5150 has a basswood body identical to the original, with a bolt-on quartersawn maple neck featuring a comfortable modified “C” profile, hand-rubbed back finish and “hockey stick” headstock. The fast-playing compound-radius (12”-16”) maple fingerboard has 22 jumbo frets, black dot inlays and a convenient heel-mounted truss rod adjustment wheel. The 5150 is also fitted with a custom designed EVH® Wolfgang® alnico 2 Humbucker bridge pickup, delivering the perfect amount of power and articulation with sweet sustain and thick chunky rhythms in a perfectly balanced EQ curve. A custom designed EVH-branded low-friction volume knob provides for unmatched performance and even-volume tapering for the smoothest volume swells. Decked out with a rock solid “dive bomb” certified EVH-branded Floyd Rose® bridge, each locking nut tailpiece features fine tuners and a patented EVH D-Tuna® for switching back and forth from drop-D to standard tuning in an instant. With its quintessential red 5150 hologram numbers and star decals, the Striped Series 5150 is a high-powered, high-performance machine that’s as kickass to look at as it is to play.